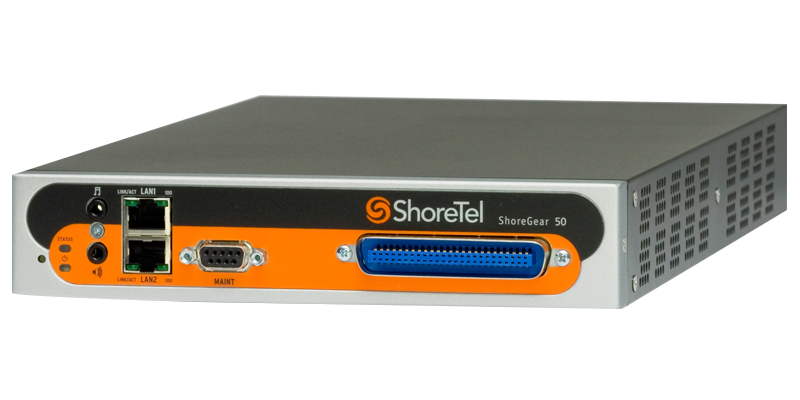 The ShoreTel Voice Switch 50V is a 1U half-width voice switch that supports up to 50 IP phones and up to a maximum of six analog ports (four loop start trunk and two analog extension ports). The ShoreTel Voice Switch 50 supports ShoreTel IP phones, softphones, and SIP devices. The ShoreTel Voice Switch 50 interfaces to standard analog trunks using loop start or wink start signaling as well as to standard analog telephones including CLASS feature phones with Caller ID Name and Number and Message Waiting.